Following are 4 simple steps for the completion of a well-built patio. Spread out damp Stone Dust to a depth below the finished patio level to coincide with the thickness of stone to be used. As you lay each stone you will have to do a certain amount of leveling for each stone as described in Step 3. Irwin Stone carries a complete line of flagstone in all different thicknesses. 1-1/2″ thick or thicker stone is best suited for laying patios of this type. THE THICKER THE STONE, THE BETTER THE JOB. Start at one corner to lay flagstones. Lay flagstones along tight string on finished grade. Using a wooden mallet or a 2 pound hammer and block of wood, tap stone into place. If stone is tapped below finished grade, raise stone and spread more stone dust under stone. Determine where more stone dust is needed by the impression the flagstone leaves in the stone dust. Be sure to fill all voids under the stone. Reset the stone and tap into place. Set the next stone. Set all stones along one edge of the patio using string and long straight edge to insure a level surface then set the rest of the stones. Use level on top of long straight edge for a long level. Continue on to Step 4. 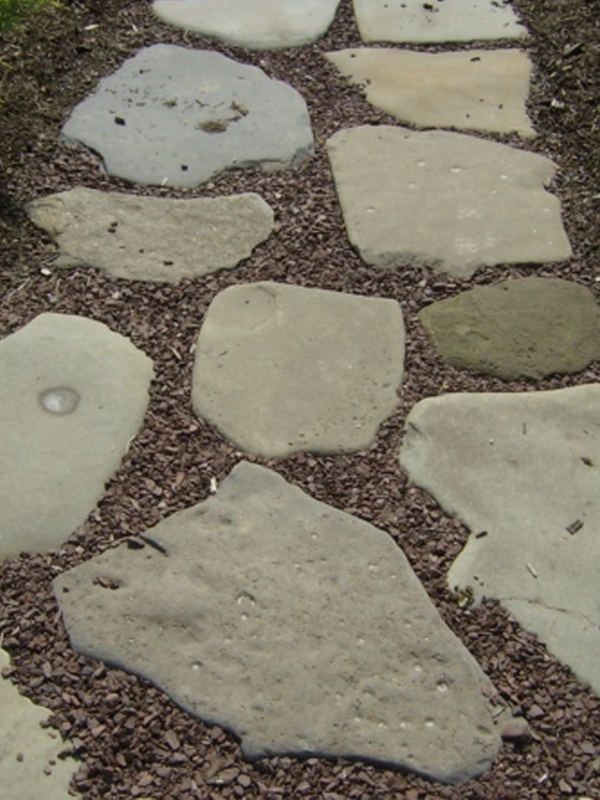 Sodding – Use a wedge shaped stock about 4-inches wide to press down the stone dust between the stones. Fill between the stones with topsoil to within approximately one inch of the tops. Cut sod into strips and press down between the stones. If you do not want grass growing between the stones, put down a layer of landscape fabric below the stone dust and packed stone dust between flagstones. Never fill between the flagstones with cement unless the flagstones are laid on a concrete base. Seeding – Use wedge shaped stick to press top soil between the stones. Fill to within 1/2-inch of the top. Mix grass seed with topsoil, by volume, 1 to 1 of seed and topsoil. Mix well. Fill between the flagstones and press in with wedge shaped stick to level of flagstone.